Have you ever made a skillet cookie? Oh dear gosh, I really hope you have! Never made one before yesterday. Never had one either, but that has to be obvious because if I had, I would have been making them at least once a week. I am honestly a little (err a lot) sad that I have been missing out on these skillet cookies my whole life. I mean, it has to be one of the better things I will ever make in my skillet. I made this yesterday. I never show you guys stuff I made the day before, but this could not wait. I was just too excited about it. 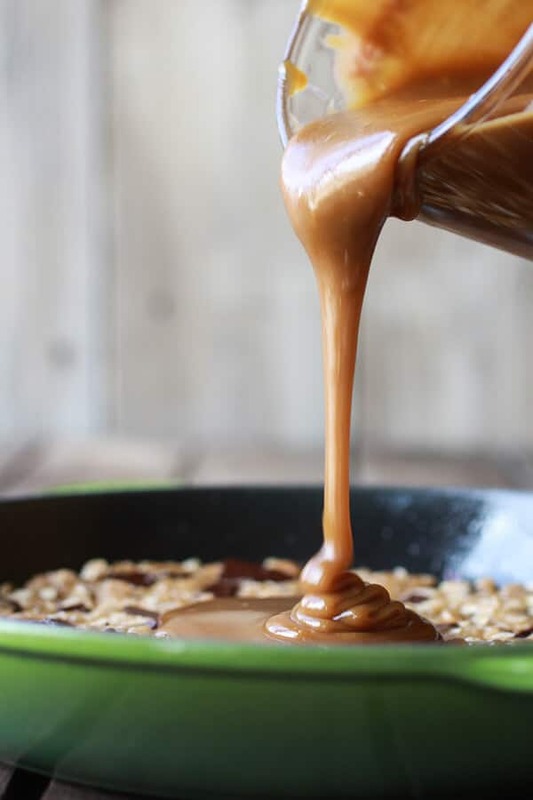 And even with making your own caramel sauce it could not be any easier to throw together! And I promise, I am not messing with you. Like even if you are the busiest person ever, you could still make these everyday. Fine, that is maybe a little stretch. I’m sure if you are the busiest person ever, with a task list a mile long, than making a skillet cookie might not make it on to that list everyday. But once a week for sure. So there are not any apples baked INTO the cookie. I am just not a huge baked apple person, although this fall I have been oddly really into them. I have caramelized them, roasted them, and again and caramelized them again one more time. I am still all about a fresh crisp caramel apple though. 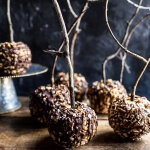 Like these bourbon caramel apples. SO good. So instead of baking the apples into the cookie, I just topped the HOT and GOOEY cookies with fresh apples and an extra drizzle of caramel sauce. I say extra because the whole center of this cookie is filled with salted coffee caramel. It’s crazy, insane, awesomeness! I gotta tell you a little about the coffee caramel. Your house is going to smell incredible. 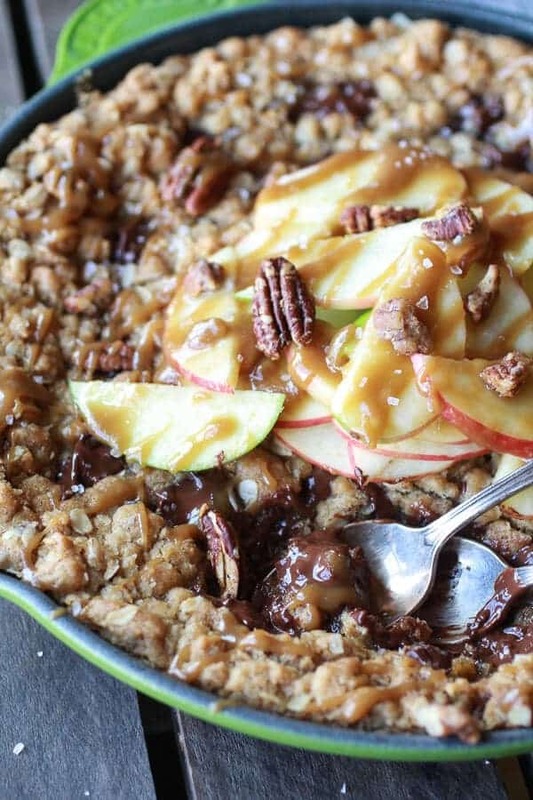 There’s coffee, Kahlua, caramel and oatmeal all in one irresistible cookie. 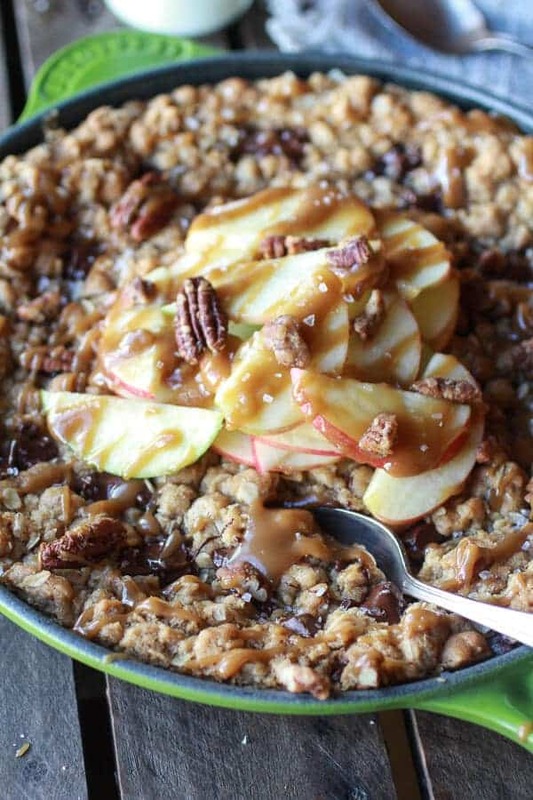 It’s fall baking like no other. Oh, and it’s loaded with chocolate chunks. I know, I know. YUM. Preheat the oven to 350 degrees. Grease 10 or 12 inch oven safe skillet. To make the the caramel add the coffee and brown sugar in a medium sauce pot. Bring a a boil and boil 5 minutes. Slowly add the coconut milk and butter, whisk to combine. Bring back to a boil, reduce heat to a low boil and cook 5 -10 minutes longer, until the sauce has thickened and coats the back of a spoon. If using a candy thermometer do not let the sauce go above 180 degrees F. Remove from the heat and stir in the Kahlua and salt, set aside. To make the cookie dough, in a large mixing bowl or bowl of a stand mixer, add the oatmeal, flour, brown sugar, baking soda, salt, melted coconut oil, eggs and vanilla and beat until combined and the dough holds together (the dough will seem oily, this is good). Mix in about 1 cup of the chocolate chunks. Turn half the batter out into a prepared pan, pushing the dough into pan. Then pour about 1 cup of the caramel overtop and spread it out all over the cookie. 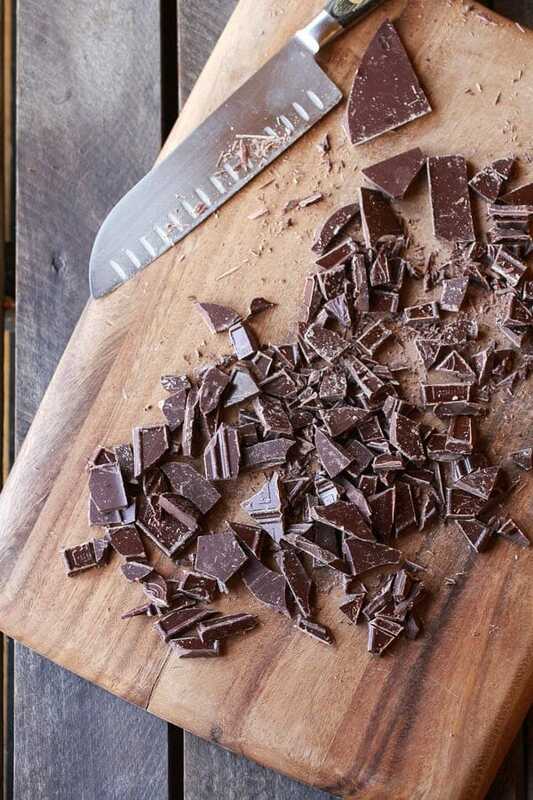 Sprinkle with some chocolate chunks and then place the remaining half of the dough over the chunks. Some of the chunks will most likely be sticking out, that is fine. Don't worry about it looking perfect. If desired you may even add more chocolate to the top. Most of the time I do. Bake for about 20-25 minutes, just do not over bake. Underdone is always better in my opinion. Remove from the oven and let sit 5 minutes. 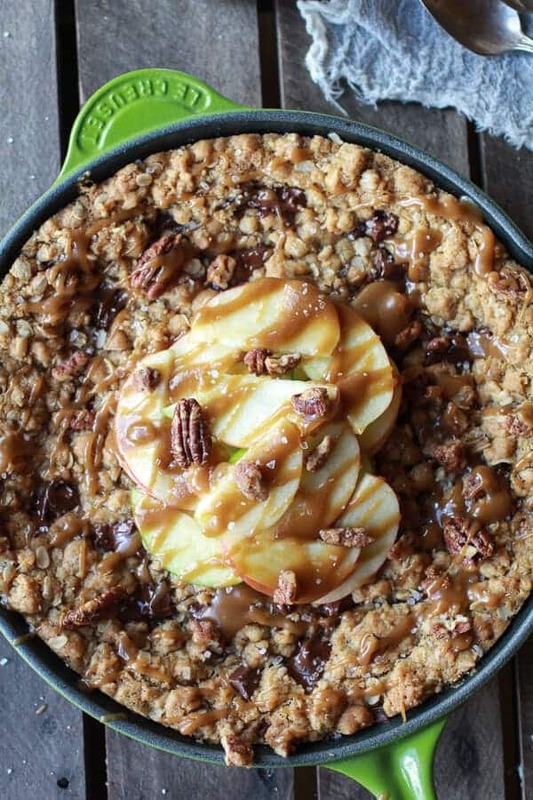 Top with the thinly sliced apples, a good drizzle of the remaining caramel and then finish with the roasted pecans and a sprinkle of sea salt. DEVOUR and enjoy! Oh, and if you are feeling real crazy, add a scoop of ice cream! 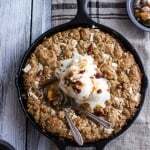 I love making skillet cookies and this is your first?? Omg what a gorgeous first effort! And that green Le Creueset was tailor made for an apple recipe. Now you just need one in every color – me too 🙂 Pinned! 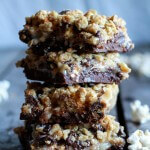 love the oats, the texture, the chocolate, oh yeah! Ok, yes, this needs to be done, but first I need one of those gorgeous skillets! Is this real life?! I’m in love!! WOW!!!! I have never made a skillet cookie either. This one sure looks like one to try. Oh I hope you make this soon!! You will love it! Thanks Charlotte! Fabulous. Just Fabulous. I can only imagine how yummy it smells, and it looks so pretty in that green Le Creuset. I’ve never made or eaten a skillet cookie.. but I think I might have to try now!! OH I hope you try this one soon! You will love it!! Thanks so much, Purdy!! Filled with salted coffee caramel?!! Wahh, I need one. 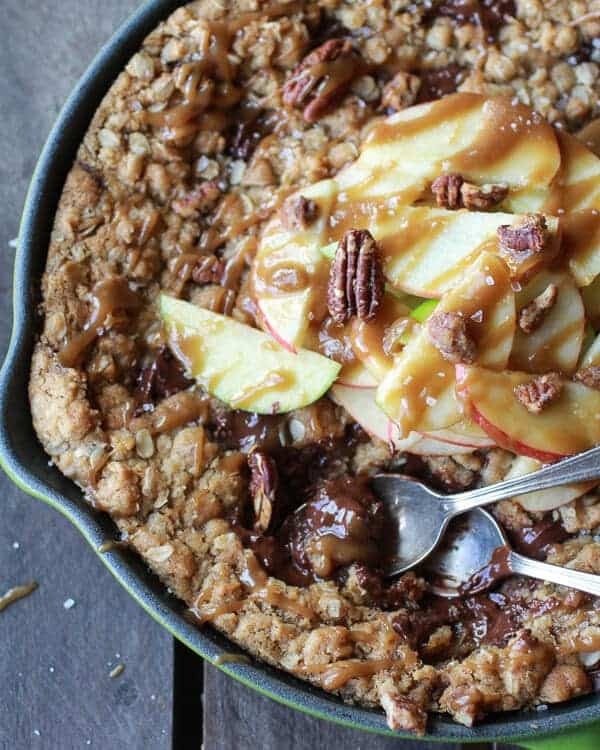 It’s like you took every awesome baking ingredient in the world and smashed them all together in this glorious skillet cookie. Ha! I am sure I could fine more to add! LOL! Thanks Laura! That caramel picture! Everything about this looks so phenomenal. Thank you so much, Rachel!! I wish I could share! Oh girl… all I can say is heck to yes! Skillet cookies are literally the best things! So happy you made one with ummm caramel apples!!!! How have I never even heard of such goodness? I gotta have one!! I can’t wait for more of these spectacular goodies!! Chocolate chip pleeez! You are just BRILLIANT!! Ohhhh man I gotta try this one, Yummmmmmm! 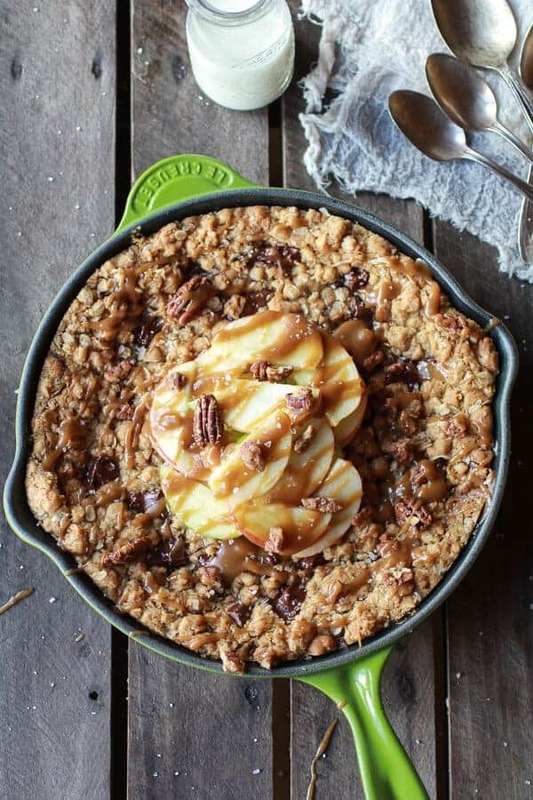 I never made a skillet cookie and woah this is so gooey, I need it! You really do have to try this!! You will love it! Thanks Sophia! I can’t even handle how awesome this looks. My brain is going into 7th heaven mode just staring at it! You’ve got my endorphins going, girly…must make skillet cookie ASAP! Wow. What’s NOT in this beauty? Love it! This looks insanely delicious…salted coffee caramel?!? OMG. Thank you so much, Molly! The coffee caramel is insane! I’ve never made a skillet cookie either! I have to now – this is just gorgeous! Thank you, Laura!! I think you would love a skillet cookie! I want to eat that for breakfast with a huge cup of coffee. That’s ok, right? Right?? YES! I mean, it is oatmeal and apples, so I say go for it!! Thanks Mimi! Hope you get to make this soon! Yum just oh my goodness YUM! I’ve got to try making a healthy skillet cookie sometime. I’ve just got to. Oh and Coffee Caramel sounds like something from heaven. Thank for pinning, Abbie! 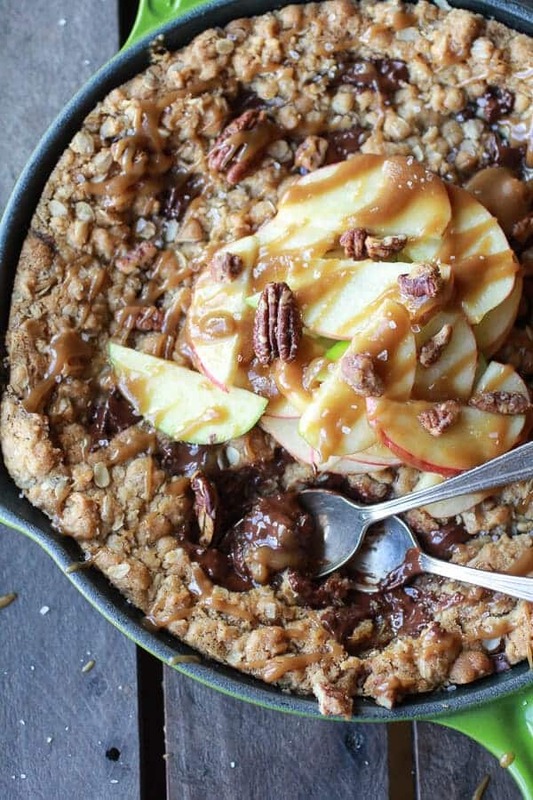 And yes, you need to make a skillet cookie. You will love it! 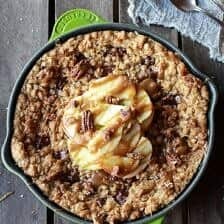 I have never made a skillet cookie Tieghan! And now I simply have no excuse not to try it. You can only imagine my excitement over here about this recipe of yours. Caramel apple anything is at the top of my dessert list. 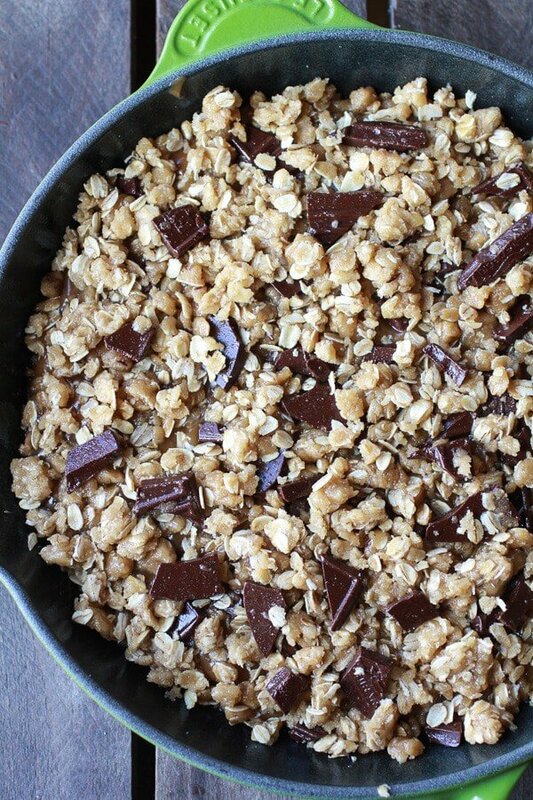 Not to mention the oats and chocolate (!!!). Thanks so much, Sally!! You have to give a skillet cookie a try! I know you will love it!! Absolutely insane Tieghan! I love everything about this cookie – chocolate, oats, caramel (ohhh the caramel…) Pinned and sharing on Facebook tomorrow! Ha! Thank you, Gail! Hope you love this! 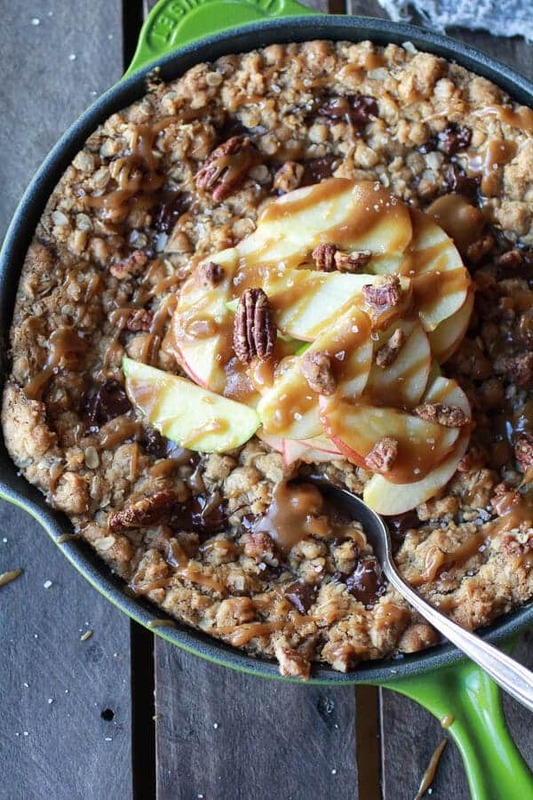 You get the award for best use of a skillet pan!!! This looks phenom!! I’m not a coffee drinker….what could I substitute for the 1 cup of coffee? Or is it not very coffee tasting? I made this and it tasted DELICIOUS. I could not get the caramel to thicken up though so the whole cookie was too mushy, but it didn’t matter as it still had the fabulous caramel and coffee flavor. OH man!! I wonder why your caramel did not thicken. Did you bring it to a boil?? Who knows…I brought it to a boil twice and let it simmer for a while too. I did something wrong. 😛 I will more than likely try making it again because it was a hit! Yum! I love adding different extras each time; that’s a great idea. Apple and chocolate is a surprisingly tasty combo. I halved the quantities and baked this in a 6 inch cake pan- it worked wonderfully, thanks so much for the delicious recipe! Thanks Liz! So happy you loved this! Is it okay to nix the oats from this w/o it affecting the way it turns out? Oats aggravate my acid reflux. Do you have a suggestion for a substitution? Hey Tasha, you need to repace the oat with something. Maybe a cereal like rice krispes or corn flakes? Would those work for you? Maybe I’ll try the cornflakes. What if I tried it with more nuts, would that work? That might work, but I think you need something that will bake into the cookie nicely. I am not sure nuts would do the trick, but I think cornflakes would work great! Just made thi tonight. My caramel did not thicken either. Perhaps it was because I used Lite Coconut milk? I let it boil for a longtime too, but it just remained “soupy”. Regardless, I poured the soupy caramel into the skillet, over half of the batter, and it came out just wonderful. I did not however, pour any remaining caramel over the final product. Thanks! Hmm, it might have been the light coconut milk. So happy you loved this! Thanks Laure! Looks lovely! One question (which may seems silly)…when you say “oatmeal” in the ingredients list are you referring to prepared/cooked oatmeal or just oats (rolled/quick/etc.)? Just old fashion uncooked rolled oats. Thanks and hope you love these! Thanks 🙂 Trying these tonight because my son is a cookie monster! Yup, this will still be delicious minus the caramel. Enjoy! Would it be alright to make the caramel in advance? I’m looking forward to making this cookie for my mom’s birthday but I won’t have a ton of time to bake day of. Hoping to be able to make the caramel the night before! Hey Annie, that will work great.Just warm the caramel over the stove or in the microwave if it is too stiff to pour. Hope you and your mom love this cookie!! 🙂 Tell her I said happy birthday! i made this and it turned out awful. The caramel was too soupy and the oat mixture was way too runny and I followed the recipe exactly. I wasted a lot of time and money on this recipe. It sounded like a good idea but didn’t work. Hey Jen, I am so sorry this recipe did not work out for you. I have had others make it and love it, so I feel horrible you had a flop. Let me know if you have any questions. 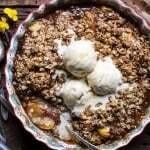 I was looking for apple recipes and stumbled on this. This sounds really delicious but would it be okay if I omit the Kahlua or should I replace it with another liquid? HI! Omitting the kahlua is totally fine. Not sure if you’ll ever see this since this recipe is so old, but I make this skillet cookie all the time. Seriously, all the time. Whenever we have someone over for dinner, I just have to make it and share the awesomeness. I’m now grain free and am missing it so, so, so much. So I made an almond and coconut flour version, with the same caramel sauce. It was pretty good, but this recipe is still better. One day, I’ll eat this cookie again… One day. 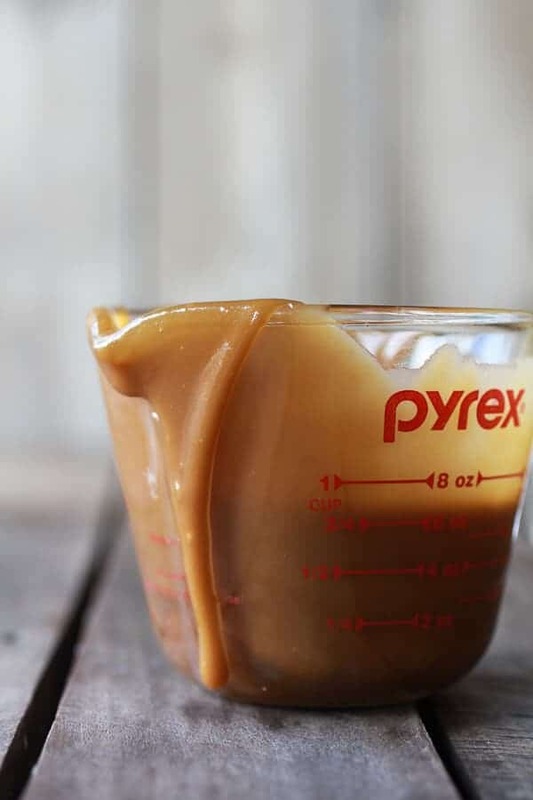 Can you freeze the caramel sauce for later use or even just refrigerate it?